Noise consists of sounds that travel through the air as a series of waves, which are described and measured in decibels dB(A). Noise is also characterised according to loudness (amplitude) and pitch (frequency). These components can make noise less noticeable, for example the sound of an air conditioner; or more annoying, such as tonal or impulsive sounds like vehicle horns. We experience a range of noises in everyday life, which affects everyone differently. People who live in quiet areas will often experience an increase in noise more than those living in noisy environments. Above graph provided by the New South Wales Minerals Council Factsheet. Our mines generally operate 24 hours a day, seven days a week. Under certain weather conditions, mining noise can be heard in neighbouring community areas from time to time. Haul truck engine and exhaust, track noise from dozers, and impact noise from the loading of material into trucks are some of the more commonly audible sources. Meteorological conditions have a significant influence on the propagation of noise from one night to the next. Prevailing wind conditions and the presence of temperature inversions affect the way that noise travels through the air and is experienced nearby. *The MTW fleet are fitted with sound attenuation packages reducing their noise levels. 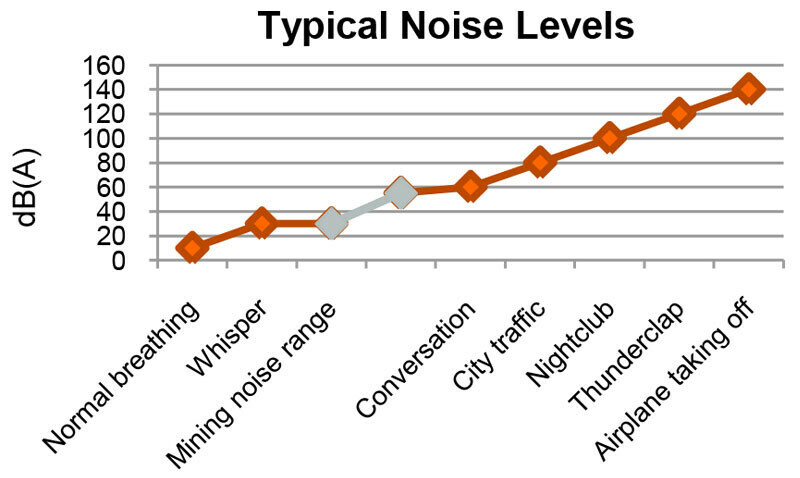 Some types and styles of Trucks are louder than others, these are assigned to work areas further away from receptors. Touch loading minimises the dropping distance when loading material into the back of trucks - a common source of "impact" noise. MTW's Community Response Officers (CRO's) undertake a range of environmental management activities. Through handheld (attended) noise monitoring, the CROs investigate and validate real time noise alarms, and verify the effectiveness of any changes made in response to elevated noise levels. The CRO's carry out routine attended noise monitoring at several locations surrounding MTW, including the Bulga and Long Point areas. Our CROs communicate regularly with the mine shift coordinator (OCE) to help the site make changes to its operations if noise levels are rising, and to let them know whether the changes are working to reduce the noise levels in real time. Our CROs also speak with community members who raise concerns about mine noise. They receive and respond to complaints and inform community members of current noise levels, and (if applicable) any changes that have been implemented at site to minimise noise. Compliance assessments are undertaken by specialist consultants on a routine basis. Monitoring is completed on a random basis, once per month at a number of locations surrounding MTW. The results of compliance monitoring are reported publically each month in the document library of this website. For more information on compliance assessment, please refer to the MTW Noise Management Plan. Noise emissions from open-cut mines are regulated regulated through the Protection of the Environment Operations Act 1997 (NSW). The EPA provides a framework for the assessment and regulation of Industrial Noise in NSW. Noise limits applicable to individual private residences are defined in the relevant Planning Approval, which also sets out the requirements for monitoring performance and reporting. You can find out more about how we manage noise impacts to ensure that levels do not exceed the specified criteria in the MTW noise management plans along with supporting documentation in the websites Document Library.